Ships are your central units of gameplay. You need them to discover new resources, transport items, or build and erase blocks or buildings. They can be commanded as RTS units on the map. Also, you can take them into PVP/PVE instances for a battle or mission. 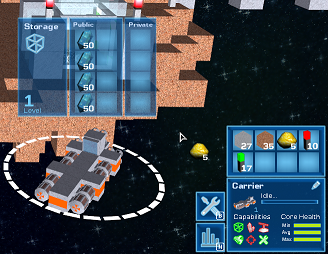 Every ship can be designed and built by your own in the Ship Designer. Dependent on the blocks and modules of a ship, it has different capabilities. Ships with loading slots, also have their own item inventory each. To select a ship, left-click on it. A circle around the ship will appear, such as a ship context menu displaying the health, capabilities, and the loaded items of the ship. You can move a selected ship by right-clicking an empty location in space. To interact with an own or allied building, the ship must be inside the interaction range of the building. Some buildings (e.g. Docking Bay, Jump Portal) can only be used by ships, which fit into it, resp. have an equal or lower level. Buildings higher than the World Level can't be used at all. To attack an enemy, the enemy must be in range of the weapons attached on your ship. Different weapons have different ranges. If none of your weapons can reach the enemy, your ship will move towards the enemy. Note: To harvest crystal, no interaction is required, the ship will start harvesting automatically, when inside range. When a ship is interacting with a building, you can see both the ship context menu and the building context menu. If both the ship and the building have item slots, you can move items/resources/blocks between those two. Hint: You can keep the Alt key pressed in order to freely move the mouse instead of rotating the camera. Left-click to pick up a complete stack from the item slot. Right-click to pick up half of the stack (rounded down) from the item slot. Left-click on an item slot to drop the complete stack from your hand into the slot. Right-click on an item slot to drop half of the stack (rounded down) from your hand into the slot. Left-click into space to drop the complete stack as collectable item into space. That way other ships (own ships or other players ships) can pick them up. Harvesting Requires modules from the Harvest category in the ship designer and at least one Storage. Harvesting modules need to be supplied with Kit Cores. Ships with this capability can be moved over a crystal field (of any colour) to harvest crystal from that field. Detecting Requires modules from the Detector category in the ship designer. Detector modules need to be supplied with Kit Cores. 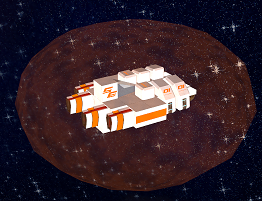 Ships with this capability can detect resources inside of asteroids without them needing to be damaged. Movement Requires modules from the Engine category in the ship designer. Engines need to be supplied with Engine Cores. Ships who lost their engine in a battle, can't move. Attack Requires modules from the Weapon category in the ship designer. Weapons need to be supplied with Weapon Cores. Ships with weapons are able to attack enemies in PVE missions or PVP arenas. Build Requires modules from the Storage category in the ship designer. Building ships need a storage to be able to collect erased material and load material to be built. 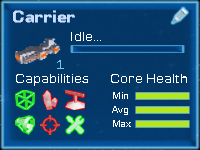 A green icon means: This ship has the capability of that type. A red icon means the opposite. You can also filter for capabilities when using the Ship-Finder, or when you import a subscribed ship from Steam Workshop. That way you can easily find battle ships or detector ships, for example. Last but not least, ships can have shields. Shields are automatically added as soon as a ship has at least one Shield Core. As shields are visible to anyone, these are not listed in the capabilities. This page was last modified on 19 March 2016, at 12:54.